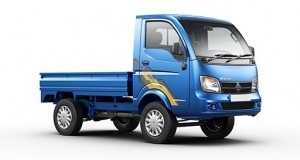 Tata Motors has announced the launch of the Tata Ace Mega pickup. The Ace Mega has been designed as a transport solution for the small commercial vehicle (SCV) segment, according to the automaker. The Tata Ace Mega comes equipped with a two-cylinder 800 cc DiCOR engine, which delivers 40 hp. The lightweight aluminum engine and 5-speed gearbox facilitate a smooth drive and enhance fuel efficiency, according to the automaker. Large brakes ensure best-in-class brake efficiency and longer life of the vehicle. The strong and rugged front and rear leaf-spring suspensions and axles make the Tata Ace Mega the perfect vehicle for varied load and road conditions. Best-in-class speed of 90kmph ensures more trips due to the low turnaround time. In an economic environment where the cost of fuel is the biggest expense in business, the Tata Ace Mega, will offer the Indian customer, best-in-class fuel efficiency of 18.5kmpl. The Tata Ace Mega features an ergonomically located driver console, glovebox with lock, provision for music system, mobile charging facility, digital clock, and full fabric seats. Features such as leaf spring suspension with rigid axles both in the front and rear, truck-like construction, seven inch vacuum booster in the braking system, etc, make the Tata Ace Mega suitable for various applications, according to the automaker. The Tata Ace Mega offers a rated payload of one ton with a new reinforced load body. The vehicle also offers a suitable cargo load deck size for market load operation. It is equipped with 14inch tires and has a high ground clearance of 175mm and gradeability of 30 percent to ensure the stability of the vehicle on varied load and road conditions, according to the automaker. The vehicle also comes with an assured warranty of two years /72,000km (whichever comes first).